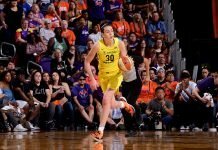 The Sky edged the Sparks, 82-80, to hand them their first home loss of the season. The Stars routed the Fever, 85-61, for the second series victory in eight days. Kelsey Plum scored a career-high 16 points. Seattle will light the city up to celebrate Saturday’s game. The All-Stars talk about the game. In the course of discussing sexism and racism and the WNBA, Sue Bird comes out. After 13 years in the WNBA, Lindsay Whalen stays involved with her alma mater. Jasmine Thomas is hitting her stride with Connecticut. Allie Quigley’s All-Star selection is a fitting honor. Theresa Plaisance is spreading her basketball Wings. Devereaux Peters is giving back at her old high school. Missouri has beefed up their schedule. Iowa State is working to replace lots of production. Alex Johnson is ready to lead Middle Tennessee. Bridgette Gordon is Tennessee’s new assistant coach. Christal Caldwell is West Virginia’s new assistant coach. New Mexico State’s new assistant coach is DeAudra Brown. …are the real first family of hoops. U16 team member Diamond Miller helped the USA win gold with her versatile game.